First off, a confession. I made a mistake. The Team Challenge Sports Basement discount event is on Sunday, November 14. (As opposed to THIS Sunday, November 14.) So now you have plenty of time to email me (waldroplaura@gmail.com) and request an invite! Now for my second confession. I have been secretly toying with the idea of running a half marathon before the Las Vegas Rock ‘n’ Roll Half Marathon. (The one I’ve been officially training for.) My mileage is on track, and I’m anxious to get out there! I have been holding off, biting my tongue and quietly pleading with my hip to play nice. At the risk of jinxing it, I’ll go ahead and put the following statements in writing: My hip has been feeling really good! I think I can do it! I’m also interested in signing up for some hills. Yes, you read me correctly. After all the Benician hill running I’ve done, I’ve actually come to enjoy…no, that’s not the right word…tolerate them. I figure I’ll take it easy on Half Marathon #1 and see how I do. With more time and a flat course I can only do better in Vegas, right? Well, I’m just way more interested in this one. I’ve been to San Francisco before. And I’ve run along the bay and across the Golden Gate bridge in 4 other races. Been there. Done that. It’s lost it’s thrill. Let me start with a disclaimer: I fully recognize that they’re all good causes. BUT. I like the Malibu charities better. Most of them have to do with kids. Education, kids with cancer, at risk youth, running programs for girls etc. I tend to get pretty on board with children related charities. There’s 9 aid stations, instead of 6, and they’re serving coconut water! I can’t seem to find the US Half Marathon fuel info, but if I were to wager a guess I’d put my money on Cytomax. Ewww…Cytomax. Okay, I just checked, and there comes my third confession. The charity is St. Jude’s Children’s Hospital. When it’s all said and done, this will be cheaper. 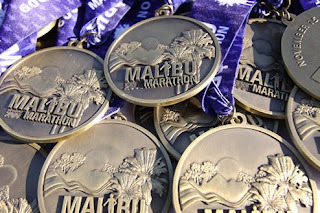 I wouldn’t have to persuade Jason that we need to go on a running related trip to Malibu. What’s a girl to do?! I need your help!! ← Sports Basement Discount for Charity! Sounds to me like you are leaning more towards Malibu! My selfish reasons are saying the US Half because I'll be there too 😉 But it sounds like you already have your mind made up and I can definitely understand the appeal of somewhere new!